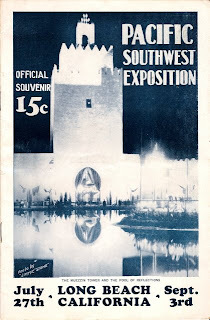 Several editions of the Official Souvenir Program were published during the thirty-nine day run of the 1928 Pacific Southwest Exposition. Averaging sixteen pages in length, the fully-illustrated program contained general information about the exposition, a calendar of events, sponsor advertising, and a double-page map of the grounds. 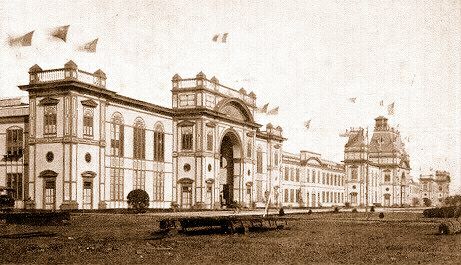 Among the events listed were numerous musical & theatrical performances in the Open Air Theatre, and the Little Theatre; free entertainment on the "Fun Strip"; band performances at the Pool of Reflections' bandstand; Mohammedan Prayer Chants in the Muezzin Tower; and the various international entertainers strolling the grounds. At the center of the Souvenir Program was located a hand-drawn aerial-view map of the exposition, looking north-west; with numbers identifying the many exhibit buildings and attractions upon the grounds. The map was numbered as follows: 1 - Entrance Dome; 2 - Cafeteria; 3 - Palace of Education and Liberal Arts; 4 - Athletic Stadium; 5 - Palace of Textiles and Modes; 6 - Ship Cafe; 7 - Main Court & Pool of Reflections; 8 - Palace of Transportation; 9 - Palace of Industry & Muezzin Tower; 10 - "Fun Strip" Amusement Area; 11 - Open Air Theatre; 12 - Denmark, Holland, Norway, Sweden, and New Zealand Building; 13 - Czechoslovakia Building; 14 - Japanese Building; 15 - Guatemala Building; 16 - Belgian Building; 17 - Fire Station; 18 - Ecuador Building; 19 - French Building; 20 - Bolivia Building; 21 - California Building; 22 - Italian Building; 23 - Persian Building; 24 - Entrance to China Exhibit; 25 - Mexican Building; 26 - Palace of Fine Arts; 27 - Latin-American Building; 28 - Garden Court; 29 - (no number); 30 - Administration Building; 31 - Water Entrance & Boat Landing; 32 - Banquet Hall.